Must be bored as hell huh lol. Dont worry, Im still trying to wait till I get some more names. When I called D&B and and GW they really were not coming down on price. Its pretty much show up, and pay normal prices. So im not too sure about those. Again, this is only in the pre-stages, so if someone else wants to jump in and throw around more ideas that would be great. Yeahm but cant force a hand if we dont have the backing for it. But we have plenty of time to setup a nice meet so no worries. id be up for this.. i feel like i dont know anybody anymore on here... im into meeting new people.. i havent been active on this site for about a year lol.. Cheesecake, Yeah I know, we do! We should try and do this before the winter happens! Bronzecavi, There isnt a date setup yet. Were still trying to figure out where/when we can do this. Too bad you missed the last one back in August it was a pretty decent meet. We will have more. Im also planning on hitting up a few of the WI GM Tuners meets. unfortunatly there next one I wont make it too. But if they end up having one, ill keep everyone posted and maybe we can make a trip out there. i'd love to come but i'd need a date and location bfore i could commit. Oh no! Kurt, remember what happened last time you brought your girlfriend to a meet !?! I'll put myself down as a maybe. It will depend on when, where, etc. I love how all the "old timers" are coming out of the woodwork ! Bwahahaha, I love how he just says it like its nothing hahahahaha. Well, at the time, you said Cerra was cool too ! Yeah, that's Kurt for ya ! 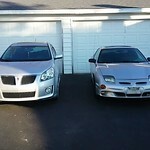 Yes, that's true, although I'm afraid if I'm around a bunch of Js, I'll miss my Sunfire GT even more than I already do . Considering D&B and GW seem pretty much out, what do you guys want to do? I would be fine with busse again, but would prefer something more engaging this time if possible. I would love to get another Sunfire, but than again I am no longer into wasting a ton of money on modifying a car so it wouldn't really be a good idea. I'll stick with the Vibe. Somewhere in the middle. Obviously so no one person has to drive the farthest. Obviously someone will still have to drive farther then anyone else, but it tries to keep it fair. But idc ill drive wherever!! we could do it here in the quad cities depending on how far people are willing to drive. the mississippi river is a wonder photo op spot.